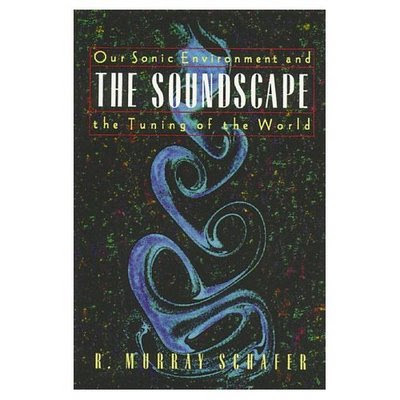 I just began "The SoundScape :: Our Sonic Environment and the Tuning of the the World" by R. Murray Schafer. This is a really interesting book with very compelling observations on how one might hear the world. The underlying notion to me seems to imply listening as something more active, less passive. So I thought it would be a nice idea to put the glossary terms here in order that they might be considered. ACOUSTIC SPACE :: The profile of a sound over the landscape. The acoustic space of any sound is that area over which it may be heard before it drops below the ambient sound level. AURAL SPACE :: The space on any graph which results from a plotting of the various dimensions of sound against one another. For convenience in reading usually only two dimensions are plotted at once. Thus time may be plotted against frequency, frequency against amplitude or amplitude against time. Aural space is this merely a notational convention and should not be confused with ACOUSTIC SPACE, which is an expression of the profile of a sound over the landscape. CLAIRAUDIENCE :: Literally, clear hearing. The way I use the term there is nothing mystical about it; it simply refers to exceptional hearing ability, particularly with regard to environmental sound. Hearing ability may be trained to the clairaudient state by means of EAR CLEANING exercises. EARWITNESS:: One who testifies or can testify to what he or she has heard. HI-FI :: Abbreviation for high fidelity, that is, a favorable signal-to-noise ratio. The most general use of the term is in electroacoustics. Applied to soundscape studies a hi-fi environment is one in which sounds may be heard clearly without crowding or masking. Compare : LO-FI. KEYNOTE SOUND :: In music, keynote identifies the key or tonality of a particular composition. It provides the fundamental tone around which the composition may modulate but from which other tonalities take on a special relationship. In soundscape studies, keynote sounds are those which are heard by a particular society continuously or frequently enough to form a background against which other sounds are perceiver. Examples might be the sound of the sea for a maritime community or the sound of the internal combustion engine in the modern city. Often keynote sounds are not consciously perceived, but they act as conditioning agents in the perception of other sound signals. They have accordingly been likened to the ground in figure-ground grouping of visual perception. Compare : SOUND SIGNAL. LO FI :: Abbreviation for low fidelity, that is, an unfavorable signal-to-noise ratio. Applied to soundscape studies a lo-fi environment is one in which signals are overcrowded, resulting in masking or lack of clarity. Compare : HI-FI. MOOZAK (MOOZE, etc.) :: Term applying to all kinds of schizophonic musical drool, especially in public spaces. Not to be confused with the brand product Muzak. MORPHOLOGY :: The study of forms and structures. Originally employed in biology, it was later (by 1869) employed in philology to refer to patterns of inflection and word formation. Applied to soundscape studies it refers to changes in groups of sounds with similar forms or functions when arbitrarily arranged in temporal or spatial formations. Examples of acoustic morphology might be a study of the historical evolution of foghorns, or a geographical comparison of methods of telegraphy (alphorn, jungle drums, etc.). 1.Unwanted sound. The Oxford English Dictionary contains references to noise as unwanted sound dating back as far as 1225. 2.Unmusical sound. The nineteenth-century physicist Herman Helmholtz employed the expression noise to describe sound composed of nonperiodic vibrations (the rustling of leaves), by comparison with musical sounds which consist of periodic vibrations. Noise is still used in this sense in expressions such as white noise and Gaussian noise. 3. Any loud sound. In general usage today, noise often refers to particularly loud sounds. In this sense a noise abatement by-law prohibits certain loud sounds or establishes their permissible limits in decibels. 4. Disturbance in any signaling system. In electronics and engineering, noise refers to any disturbances which do not represent part of the signal, such as static on a telephone or snow on a television screen. The most satisfactory definition of noise for general usage is still "unwanted sound." This makes noise a subjective term. One man's music may be another man's noise. Bit it holds ope the possibility that in a given society there will be more agreement than disagreement as to which sounds constitute unwanted interruptions. It should be noted that each language preserves unique nuances of meaning for words representing noise. Thus in French one speaks of the bruit of the waves. Compare to SACRED NOISE. SCHIZOPHONIA :: (Greek: schizo = split and phone = voice, sound): I first employed this term in The New Soundscape to refer to the split between an original sound and its electroacoustic reproduction. Original sounds are tied to the mechanisms that produce them. Electroacoustically reproduced sounds are copies and they may be restated at other times or places. I employ this "nervous" word in order to dramatize the aberrational effect of this twentieth-century development. SONIFEROUS GARDEN :: A garden, and by analogy any place, of acoustic delights. This may be a natural soundscape, or one submitted to the principles of ACOUSTIC DESIGN. The soniferous garden may also include as one of its principle attractions a Temple of Silence for meditation. SONOGRAPHY :: The art of soundscape notation. It may include customary methods of notation such as the sonogram or sound level recording, but beyond these it will also seek to register the geographic distribution of SOUND EVENTS. Various techniques of aerial sonography are employed, for instance, the isobel contour map. SOUND EVENT :: Dictionary definition of event: "something that occurs in a certain place during a particular interval of time." This suggests that the event is not abstractable from the time-and-space continuum which give it its definition. The sound event, like the SOUND OBJECT, is defined by the human ear as the smallest self-contained particle of a SOUNDSCAPE. It differs from the sound object in that the latter is an abstract acoustical object for study, while the sound event is a symbolic, semantic or structual object for study, and is therefore a nonabstractable point of reference, related to a whole of greater magnitude than itself. SOUNDMARK :: The term is derived from landmark to refer to a community sound which is unique and possesses qualities which make it specially regarded or noticed by the people in that community. SOUND OBJECT :: Pierre Schaffer, the inventor of this term (l'objet sonore), describes it as an acoustical "object for human perception and not a mathematical or electro-acoustical object for synthesis." The sound object is then defined by the human ear as the smallest self-contained particle of a SOUNDSCAPE, and is analyzable by the characteristics of its envelope. Though the sound object may be referential (i.e., a bell, a drum, etc. ), it is to be considered primarily as a phenomenological sound formation, independently of its referential qualities as a sound event. Compare : SOUND EVENT. SOUNDSCAPE :: The sonic environment. Technically, any portion of the sonic environment regarded as a field for study. The term may refer to actual environments, or to abstract constructions such as musical compositions and tape montages, particularly when considered as an environment. SOUND SIGNAL :: Any sound to which the attention is particularly directed. In soundscape studies sound signals are contrasted by KEYNOTE SOUNDS, in much the same way as figure and ground are contrasted in visual perception. WORLD SOUNDSCAPE PROJECT :: A project headquartered at the Sonic Research Studioof the Communications Department, Simon Fraser University, British Columbia, Canada, devoted to the comparative study of the world SOUNDSCAPE. The Project came into existence in 1971, and since that time a number of national and international research studies have been conducted, dealing with aural perception, sound symbolism, noise pollution, etc.,. all of which have attempted to unite the arts and sciences of sound studies in preparation for the development of interdiscipline of ACOUSTIC DESIGN. It is not often that Christine and I get the chance to go away and relax together. More and more, life seems to be filled with deadlines, questions and requirements. But... we got a chance to sneak away for a weekend at sea recently and it was amazing. While I would have preferred to have sailed the boat as opposed to motor out to Santa Cruz island, the wind is as the wind is. Once there, we simply relaxed, went kayaking, and ate lots of food. While kayaking we discovered all of the secret hiding places of the mussels, the star fish and of the seals. The seals spent a great deal o time following us around, I would assume they were interested in food not companionship. Still, fun was had by all.